In the Disney Channel animated series, Elena of Avalor, the jaquins are magical half-jaguar, half-bird creatures that roam the skies, befriending Elena as she rules over her kingdom. When a few baby jaquins arrive early in the kingdom, Elena is ready to help take care of them! This set comes with a baby jaquin figure and bottle. Girls can imagine helping Elena care for the newborn Jaquin Mingo and going on royal adventures with her new friend by her side! 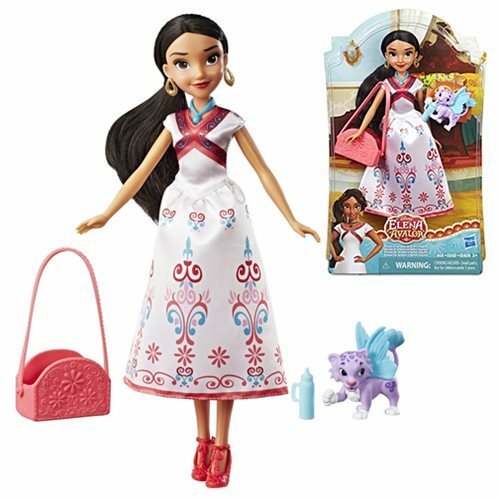 She comes wearing a beautiful festive dress, and includes removable accessories, such as a pair of earrings and a pair of shoes. Includes doll, figure, necklace, outfit, bottle, basket, pair of earrings, and pair of shoes. Ages 3 and up.